The Medusa Plot by Gordon Korman, a Mysterious Review. Review: Amy and Dan Cahill may have thought that their lives would settle down now that they have solved the mystery behind the 39 clues, the secret to their family's wealth and power, but when seven of their friends and family are kidnapped, they realize they must once again come face to face with danger in The Medusa Plot by Gordon Korman, the first of six books planned for this series. Thirteen-year-old Dan is bored with his life. "The clue hunt had stretched them to the limit of human endurance. It had shredded their very souls. It had very nearly gotten [he and his sister] killed. So why did it feel like it had been the only part of [his] life that meant anything? When you've been through something like the clue hunt, the eighth grade just doesn't measure up. How could it?" Well … that's all about to change. Following seven meticulously planned kidnappings, Amy and Dan receive a cellphone from someone identified only as Vesper One with a text message blackmailing them into stealing the famed Medusa painting by Caravaggio, which currently hangs in the Uffizi Gallery in Florence in exchange for the release of captives. The pair, together with two Cahill cousins, fly to Italy and devise a scheme to steal the painting, only to be told once they have it in their possession that it is a fake. Using their considerable resources, they deduce where the original is, and arrange to steal it. But when the time comes for them to make the exchange, the Medusa for their kidnapped friends and relatives, Vesper One changes the rules. "Perhaps you notice that your loved ones continue to accept our hospitality," he writes. "This is due to your previous treachery. They will remain our guests until you complete a few more tasks." The Medusa Plot is a fine start to this new series. 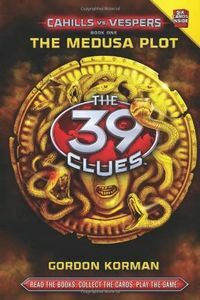 It is not necessary to have read any of the books in the original "The 39 Clues" series to enjoy this book, though there is a brief backstory in the beginning. (Spoiler alert for those who haven't read the previous series: The secret behind the 39 clues is also revealed in the backstory.) The mystery presented to the siblings is two-fold: Who is Vesper One? And what is his ultimate goal? Amy and Dan are somewhat wiser and more adept from their experiences with the 39 clues, which translates — at least for this book — into them being a bit smarter in how they deal with their foe, a nice touch that shows growth. Amy has a new boyfriend, however, which will doubtlessly complicate her life at some point, although he plays a small role in this book. Most of the previous books included some history in their storylines, and The Medusa Plot is no different, though it is somewhat disappointingly superficial. The real-life mysterious connection between Caravaggio and Leonardo da Vinci with respect to the Medusa is mentioned in passing, but little reference is made to the fact that there are two known Medusas in existence. Still, Florence — and later Rome — is painted in vibrant colors and makes for a lively and picturesque backdrop to the action. According to the publisher, the books in this series are recommended for readers aged 8 to 12, grades 3 through 7. The Lexile measure for The Medusa Plot is 730L. Acknowledgment: Scholastic provided an ARC of The Medusa Plot for this review.